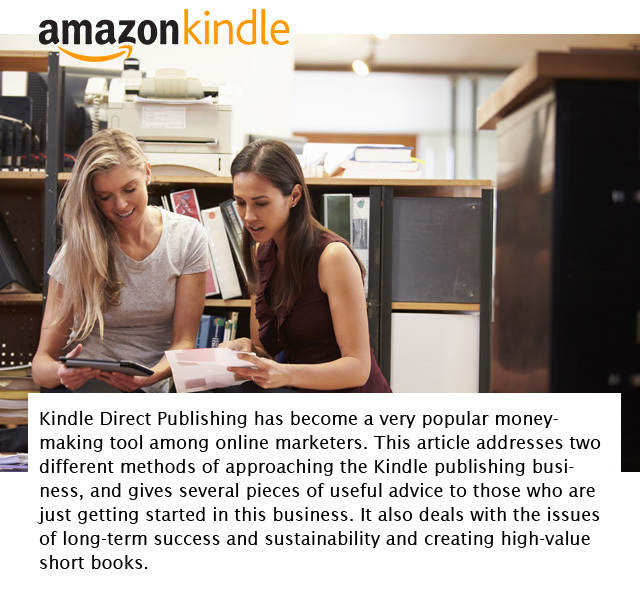 Can Kindle Publishing Be a Profitable Online Business? 2012, ebooks officially overtook physical books in worldwide sales As the digital book market has boomed, many have tried to cash in on its expansion. One of the most prevalent methods of doing so has been Amazon’s Kindle Direct Publishing platform, which allows authors to self-publish their works directly to the popular Kindle e-reader store. The ultimate question, however, is whether or not this is a profitable and sustainable online business model. To begin with, we will explore the two main ways that Kindle Direct Publishing is used for financial gain. The first method is essentially the publication of a very large number of short books. As a general rule, marketers who employ this method outsource their books to freelance writers. This gives them the ability to expand their online bookstores faster than any one person could possibly produce even short books. For this model to work, hundreds of books are generally needed, as many of these works are inherently of low quality. This method can produce excellent profits, as it only requires each book to sell a handful of copies per month to generate a large amount of income. The difficulty comes, however, when readers begin to review these books. As the books tend to be short and full of recycled information, they will get very poor reviews from readers. Many marketers who employ this system of publication will purchase or trade for higher reviews. This turns the publication process into a constant struggle to capitalize on works that have not yet received any reviews, while keeping a facade of good reviews on older works. Clearly, while profitable in the short term, this is not a model for long-term success. On the other side of the spectrum, there are marketers who treat their digital publications very much like physical books are treated. They craft extremely long, high-quality works that are almost guaranteed to get good reviews. This obviously creates the potential for long-term success, but puts a significant time liability on the author if the book does not sell well. Unlike the other method, this system does not pay the numbers game, but instead relies on sheer quality to perform. This is preferable in many regards, but requires the author to take promotional actions outside of the Kindle platform to ensure the book’s success. As the performance of a book that has not been externally promoted is entirely dependent on keyword searches on Amazon to be brought to the attention of a buyer, there is a significant possibility that such a book will sell very few copies. This model trades in short-term performance for long-term success, but requires much more work and liability. As is the case in so many instances, the best method for succeeding financially on the Kindle platform seems to be a middle road between these two extremes. Obviously, there is money to be made, since so many digital books sell every year. However, a slight paradigm shift in what a book is has occurred in the past few years. As people become busier, they no longer have the time or desire to read a book that is hundreds of pages long. In this regard, the model of producing short, easy-to-read digital books has a great deal to offer. However, readers still want value and good information. This means that the best method for both short- and long-term success with Kindle Publishing is to produce a large number of short books that are densely packed with good information. This will satisfy the obvious need to produce many books, while simultaneously offering something of value to the buyer. In the end, publishing self-written works through the Kindle platform and others like it can be an extremely lucrative business. As with any other form of business, however, your long-term success will depend entirely on how much value you can deliver to your customer. As such, it is still best to create high-quality content that will prompt readers to give your book a positive review. Kindle Publishing can be an excellent way for beginners to create passive income online, and is a very low cost business to begin.